Polish & Protect is an extremely high strength polisher for Spas & Hot Tubs. It seals, polishes and protects all acrylic, vinyl and rubber surfaces. This gives protection against moisture, harsh chemicals, and UV rays. Polish & Protect can also be used on the headrests as well as to protect many other surfaces such as garden furniture, car interiors and exteriors, household work surfaces, stainless steel and uPVC (can aid colour restoration on uPVC). 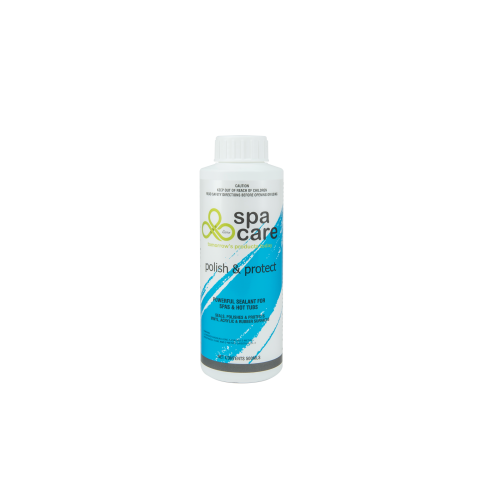 Spa Care™ Polish & Protect should be added in accordance with the directions given.